Is Eating Pork Tenderloin Good for You? When you're looking for lean protein to include in your diet, or when you simply crave some healthy meat, pork tenderloin is a good choice. It's low in fat, high in protein and a rich source of B vitamins and selenium. Pork tenderloin works well with any cooking method -- just be sure to cook it well enough to eliminate any parasites or bacteria that may be in the raw meat. 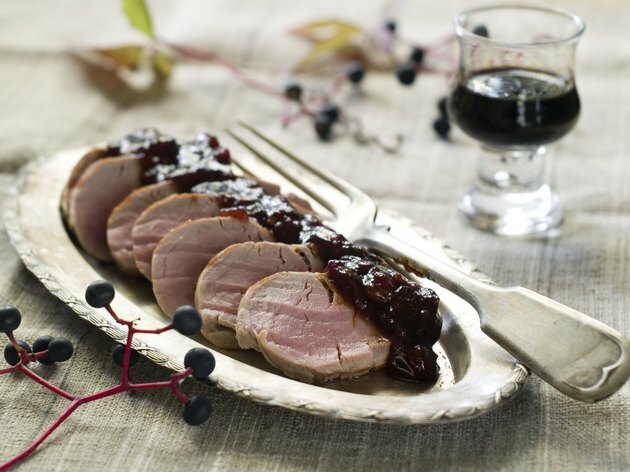 Pork tenderloin provides 22 grams of quality protein in a 3-ounce serving. With 3.7 grams of total fat, 1 gram of saturated fat and 62 milligrams of cholesterol in a 3-ounce serving, pork tenderloin qualifies as an extra-lean cut of meat. Whether you're planning a menu to reach daily protein requirements -- 46 grams daily for women and 56 grams for men -- or you're an athlete who must increase your intake, one serving of pork tenderloin is a low-fat way to add protein to your diet. When any food is called an "excellent" source of nutrients, it must provide at least 20 percent of the recommended dietary allowance, or RDA, for the specific vitamin or mineral, according to regulations the U.S. Food and Drug Administration has established. By that standard, a 3-ounce serving of pork tenderloin is an excellent source of all the B vitamins, except folate. Pork tenderloin is a good way to get vitamin B-12, which is not found in plant-based foods. All of the B vitamins help metabolize food into energy, but vitamin B-12 is essential for making red blood cells, synthesizing DNA and keeping your nerves functioning properly. Selenium forms five antioxidants and is essential for producing thyroid hormone. Your body depends on zinc to synthesize protein and it is a component of hundreds of different enzymes. Most people consume plenty of zinc, but if you're a strict vegetarian or if you have a gastrointestinal condition such as celiac disease or ulcerative colitis, you may be at a greater risk for a zinc deficiency, reports the Linus Pauling Institute. You'll get 2 milligrams of zinc from a 3-ounce serving of pork tenderloin, which fills 26 percent of women's and 19 percent of men's RDA. The same portion supplies half of your daily selenium. The tenderloin is cut from the center of the pig just below the ribs, which is a tender cut, as long as it's not overcooked. However, you must cook it properly to kill bacteria. Cook the tenderloin to an internal temperature of 145 degrees Fahrenheit. Then, let it sit for at least three minutes before carving or serving the meat. Don't skip the resting time, because it helps ensure that all harmful germs are destroyed. If the tenderloin has a silver membrane, remove it before cooking. Beware of cuts that are pre-seasoned or enhanced with a brine solution, because they'll add a significant amount of sodium. How Many Calories are in a Lamb Shank?